My name is Lisa Pietsch. I am a 1/3 owner of Tequila Aficionado, a mother of two, and a United States Air Force Veteran who proudly and honorably served in the Security Police (now Security Forces). I’m not wired to be tolerant of harassment, intimidation or oppression, favored methods used by bullies both online and off. In fact, I don’t believe anyone should be tolerant of harassment, intimidation or oppression and I believe it should be brought into the light at every opportunity for, if we allow it continue unchecked, people may begin to believe that it is acceptable. I’ve noticed in the past year or so that hate has become an OK thing to spread. I’m not good with that. Some of us were raised to not say anything at all if we couldn’t say something nice. But where does that leave us when we’re faced with bigots and bullies who did not benefit from such an upbringing? At some point, something must be said. As a longtime Social Media Manager and Strategist (my Linkedin Profile is public), I am well aware of the sound advice “DON’T FEED THE TROLLS” but some people go beyond trolling and spreading unsubstantiated rumors to personal threats and extortion. At what point do we draw the line and say that enough is enough? At what point do we stop trying to be classy with no comment? At what point do we realize we may not be the only ones affected – or that our children may be affected – and call out this unacceptable behavior? Though Mike would prefer to go the classy and tasteful route, I choose to call it out today. I’ve had enough of haters, rumors, gossip mongering, threats and extortion. Read on for the telenovela that is tequila reviewing. There were rumors spread about our relationship with Tequila David Reyes and that we had something to do with their initial outrageous pricing. In fact, the importer and owner set that price all on their own. Neither Mike Morales nor Tequila Aficionado hold so much sway in the industry as to set a brand’s pricing for them. The fact that some people think that is a little flattering considering the work we’ve put into Tequila Aficionado, but brand owners, importers, and distributors never ask us to price their spirits. As a matter of course, we always try to get the pricing of spirits we review and when informed of their price, we were just as surprised as everyone else. We were also just as surprised as everyone else when we saw a mug shot of the felony-charged brand owner. Especially since we had judged the tequila on it’s own merits as a Brand of Promise and agreed to take it on tour with us. About that tour, any brand owner who wanted to meet up with us on the road for an interview was welcome to do so. David Reyes wasn’t the only one. One of the other brand owners was Carey Clahan of Laughing Glass Margaritas. There seems to be an ongoing trend of foregoing research by the young man who posted this Instagram story to the left. Laughing Glass Margaritas are not made with mixto tequila. Anyone who can read a label can clearly see they source their tequila from NOM 1489. The tequila used is 100% agave and made with a diffusor. Carey and Sydney, the owners of Laughing Glass are also 100% transparent about that fact. Personal note: I question the ability of any tequila reviewer who doesn’t know the difference between mixto and diffusor tequilas. The same tequila reviewer posted the image to the right as well. As I mentioned previously, brand owners and importers never consult with us on their pricing. Since we neither own Tequila David Reyes nor serve as consultants, promoters or social media management, we have nothing to do with their pricing (which is currently at $110.50 at For Tequila Lovers – NOT an affiliate link). But some people like to skip the research and make assumptions. This young man isn’t the only one. 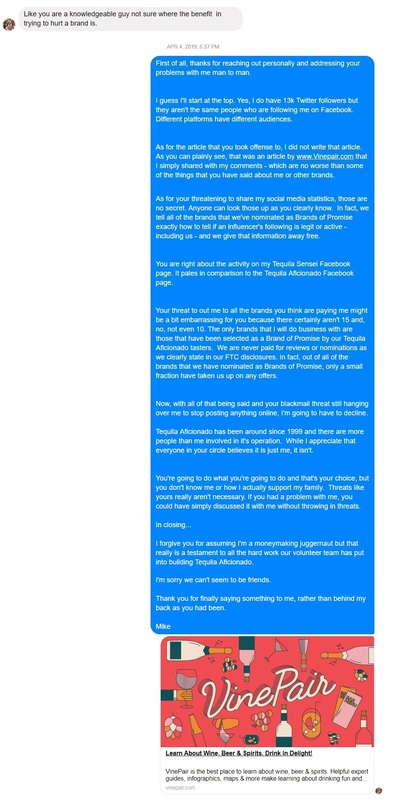 And speaking of assumptions, the same tequila reviewer sent the following private message to Mike on his personal Facebook Page (Tequila Sensei), last week, in response to a Vinepair article shared with cautionary comments about copyright infringement. Whenever possible, we try to warn spirit brands to not infringe on copyrights, fake celebrity or publication endorsements, and not to buy followers. We have as much control over brands doing these things as we do their pricing. First of all, thanks for reaching out personally and addressing your problems with me man to man. I guess I’ll start at the top. Yes, I do have 13k Twitter followers but they aren’t the same people who are following me on Facebook. Different platforms have different audiences. As for the article that you took offense to, I did not write that article. As you can plainly see, that was an article by www.Vinepair.com that I simply shared with my comments – which are no worse than some of the things that you have said about me or other brands. As for your threatening to share my social media statistics, those are no secret. Anyone can look those up as you clearly know. In fact, we tell all of the brands that we’ve nominated as Brands of Promise exactly how to tell if an influencer’s following is legit or active – including us – and we give that information away free. You are right about the activity on my Tequila Sensei Facebook page. It pales in comparison to the Tequila Aficionado Facebook page. Your threat to out me to all the brands you think are paying me might be a bit embarrassing for you because there certainly aren’t 15 and, no, not even 10. The only brands that I will do business with are those that have been selected as a Brand of Promise by our Tequila Aficionado tasters. We are never paid for reviews or nominations as we clearly state in our FTC disclosures. In fact, out of all of the brands that we have nominated as Brands of Promise, only a small fraction have taken us up on any offers. Now, with all of that being said and your blackmail threat still hanging over me to stop posting anything online, I’m going to have to decline. Tequila Aficionado has been around since 1999 and there are more people than me involved in it’s operation. While I appreciate that everyone in your circle believes it is just me, it isn’t. You’re going to do what you’re going to do and that’s your choice, but you don’t know me or how I actually support my family. Threats like yours really aren’t necessary. If you had a problem with me, you could have simply discussed it with me without throwing in threats. I forgive you for assuming I’m a moneymaking juggernaut but that really is a testament to all the hard work our volunteer team has put into building Tequila Aficionado. I’m sorry we can’t seem to be friends. Thank you for finally saying something to me, rather than behind my back as you had been. There are enough Mexican spirits for everyone to love a different one and God knows they could all use exposure from anyone with a following. Though your preferences may not be the same as someone else’s, I hardly see the need to judge and harass because of it. There’s enough room for all of us without throwing in assumptions, rumors, misinformation, and extortion. If you read this far, thank you for giving me a voice. Trolls, haters, and my upbringing have kept me silent too long.